The plan for today was to head towards the West. Having covered most of the areas we had wanted to see in Tasmania, the only parts left for us to explore were the North and North-west. 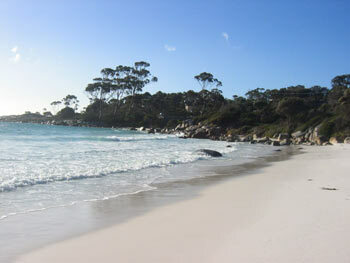 It was a nice sunny morning and before we left St Helens, we took a detour over to Binalong Bay again. The improved weather meant that we were able to see the beach in its enhanced colours. The water, showing various hues of blue, glistened in the sunlight and the white sands clearly stood out. There was no-one on the beach as even though it was a nice day, it was still a bit nippy outside. Binalong Bay, north of St Helens. At midday we stopped off at St Columba Falls near Pyengana. 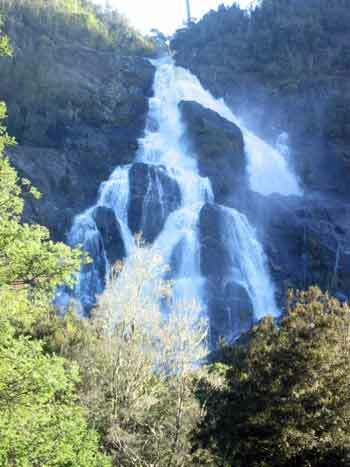 At 90m, these falls are the highest in Tasmania. We took the 10-minute short walk to the base of the falls, passing luscious green ferns along the way. As we got nearer, we could see a mist slowly moving towards us. Looking up, we could still see blue skies and realised the water was as a result of the spray from the falls. This, along with the sound, gave us an indication of how quickly water was reaching the bottom. Apparently, 220,000 litres of water comes down every minute (in the Winter months) and due to the sheer force, the water stream forks in many places to form smaller falls of their own. St Columba falls, near Pyengana. Our journey continued and at dusk we had reached Narawntapu National Park. This area used to be called 'Asbestos Range' as a result of the mining activity (of the nasty mineral) back in the day but due to its negative connotations, it was re-named, reverting back to its Aboriginal name. It intrigues me how some places are named - some after a significant person like the founder, some as a result of mineral, animal or vegetable and some, well who knows? During our travels we have come across some sombre-sounding names such as Dismal Swamp, Bay of Disappointment, Coffin Bay, Disaster Bay - to name but a few. You have to question why they were given such miserable names as it can't be good for tourism or morale! Narawntapu National Park is quite flat and not as spectacular as many of the other National Parks in Tasmania. But what it does have is a large habitat of kangaroos, wallabies and wombats that come out to forage at dusk. We had arrived just in time to see them. There were wallabies almost everywhere we looked and Ian had to stamp on Ethel's breaks a few times to let a few hop past. 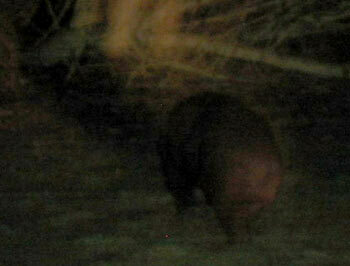 We parked up and went out with our torches to see if we could spot any wombats. A couple that we'd met at Cradle Mountain (people, not wombats!) told us that they had camped here and seen lots of wombats. Perhaps more of them come out later on in the night but we only managed to spot two while we were there. These wombats were camouflaged amongst the wallabies in a field - ok, I know they look completely different but in the diminishing light, it was difficult to tell. A wombat running away from us, as far as a wombat can run. That's the best shot we got! We left shortly after as it was dark and we needed to find a powered campsite. We ended up in Port Sorell for the night. It would have been good to have seen some more wombats. Ian had wanted to have his photo taken with a few of them - especially after how well the last one turned out at the Billabong Sanctuary, earning him a new nickname. Better luck next time, wombat boy!